If your laundry room is like most, it is probably a small white room with a lonely washer and dryer, and a small single wire shelf above to display your laundry detergent in the open for all to see. There is so much dead space! Many people use this room as a “catch all” for shoes, umbrellas, old newspapers, rags, bags of dog food, etc. Time to make a change-clean it up and give yourself the storage space and function you deserve. 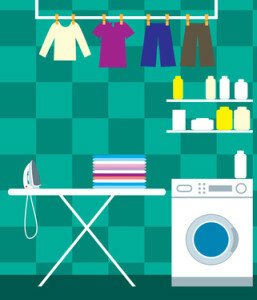 What would you like to accomplish in the laundry room, besides just washing and drying clothing? Maybe you’d like some of these options for starters: a place to store laundry detergents, an area to sort dirty clothes, a place to fold laundry, a place to iron-along with space to store the ironing board, a place to hang dry the delicates or items that you have just ironed, or maybe even a place to store all the miscellaneous items such as shoes and rain gear. Finding out what you want is the first step in making that dream a reality. Washer and Dryer – The most important elements in the room are your washer and dryer, so first make sure they are in the proper location, and that your spacing is correct. A good rule of thumb is that they sit 1 ½ to 2 inches apart and the same distance on both sides. Allow at least 6 inches of space from the wall behind it and about 12 inches from the top of the unit to the ceiling (if you are installing a stackable unit). If you don’t currently own a stackable unit, you may want to look into one if you are in the market for a new set. They come in full sizes now with many other options, and this would allow more room for cabinet space. Lighting – This is an important factor when planning your space. Windows are a great source of natural light, but you may also find task lighting helpful for matching socks or trying to get those pesky stains out. Sink – If you have the space, this would be a helpful addition to your laundry room. Opting for the stackable washer/dryer could give you the space needed to install a sink, and the water line is already in place. Sinks are great to have when it comes to those clothes that need hand washing, and if you get one deep enough, you will even have a place to give your four legged friend, Honey, a bath. There is so much you can accomplish in your laundry room. With a little imagination and research, you can make this a room that you actually enjoy being in. Stay tuned for part 2 of this article, where we’ll help you decide on the type and style of cabinets to buy for your laundry room remodel.